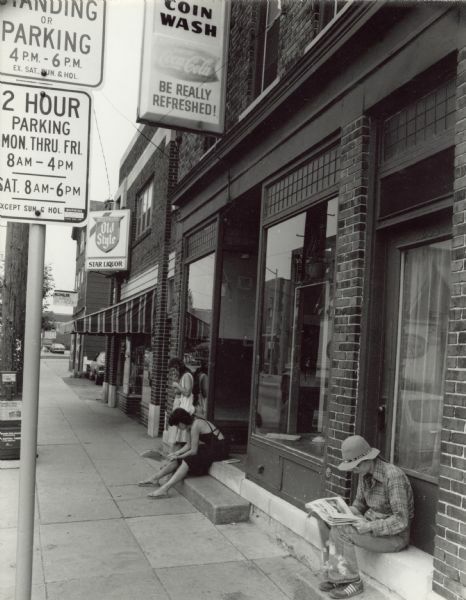 View down a sidewalk towards three people waiting outside of a coin laundromat on Williamson Street. Two women, one on steps of a doorway and another near a closed door, are sitting and reading newspapers. Another woman is standing and leaning against a window. Next door to the laundromat is Star Liquor. Caption on the bottom of the frame reads: " 'I know most of the old men in the neighborhood,' Karen Jaster, house painter by trade says. 'I buy them cigarettes and adopt them but I don't take them home. A lot of 'em live in a door stoop somewhere. Most of them are dead now. Milton got killed last winter and Charlie froze in a van.' Despite the loss of old friends, Karen likes the Willy Street community. 'It's a nice neighborhood to grow old in.' Is the area changing? 'Only that it's getting worse in terms of transient people. There's more of 'em, more of a hassle with 'em.'"